The S&P500 surged to the highest levels in nearly six-months, erasing almost all of this winter’s big selloff. What’s driving this strength? If you go strictly by the headlines, it seems the market loves Trump’s trade war. That can’t be right, can it??? No of course not. The stock market hates anything that gets in the way of free trade and the only one winning this trade war is the taxman who is enriching himself at the expense of hard-working Americans. But if the market hates this trade war, why is it rallying so strongly after Trump started taxing $36 billion in Chinese imports and is threatening to add another $200 billion? First, lets be perfectly clear, the market most definitely isn’t rallying because of Trump’s trade war. It simply isn’t selling off on the news because these headlines are already priced in. Rational traders sell the first hints of bad news. No one waits for the inevitable to happen before they react to it. When we see a rock flying toward our head, we move before it hits us, not after. The same goes for the stock market. Traders reacted to Trump’s trade war months ago when he first announced it. Anyone waiting until now to sell the trade war headlines clearly doesn’t understand how this works. All of this selling ahead of time meant there was no one left to sell the news when it finally happened. Remember, we fear what we don’t know, not the things everyone is talking about. Trump’s trade war is old news and is why the market doesn’t care about it anymore. Bears claim their time is coming, but is it really? If they couldn’t deliver the goods with such a perfect setup, what makes them think waiting a little longer will make a difference? Trade war headlines are as dire as they can get with Trump and China already threatening to tax all the trade between the world’s two largest economies. At this point things cannot escalate any higher. How did the market respond to this latest round of bearish headlines? With a lethargic, drawn out, two-week slide that barely gave up 2%. Everyone who has been doing this for any length of time knows market crashes are breathtakingly fast. Sell first and ask questions later affairs. Yet here we are two-weeks later, still waiting for the promised crash. The cold, hard truth is if it was going to crash, it would have happened by now. And not only did we not crash, we rebounded to the highest levels in nearly half a year! People often claim the market is fixed when it doesn’t do what they think it should. The brutal truth is the market is most definitely not fixed, these people are simply looking at the wrong things. Everything makes perfect sense if you know what to look for. This was a strong market, not a weak one. Anyone who realized this wouldn’t have been surprised when the market brushed off stale headlines that had been priced in months ago. But that was then and this is now. Most people already know what happened, what they really want to know what comes next. 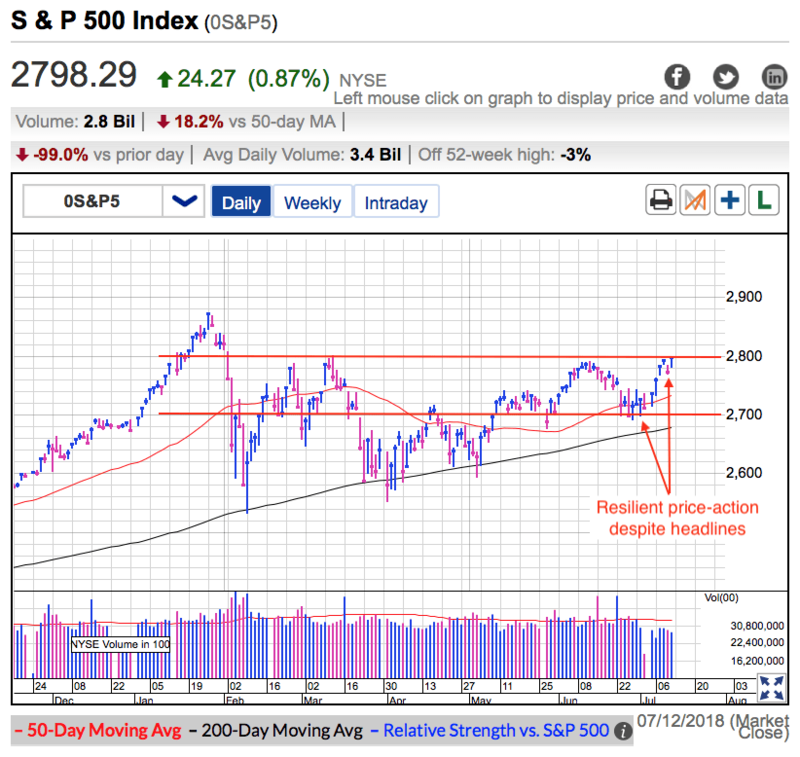 If this market was signaling strength two-weeks ago, it was shouting strength over the last several days as it defied conventional wisdom and rallied in the face of bearish headlines. If this market was fragile and vulnerable, there have been more than enough excuses to send us tumbling. Instead it is holding up incredibly well. Just imagine what will happen when we move past these negative headlines. This market most definitely wants to go higher and it won’t let anything get in its way. I don’t expect a strong surge higher from here because we are still stuck in the slower summer months. Breaking 2,800 resistance is all but a done deal and no doubt that will trigger a short-squeeze as bears give up in frustration. But expect the gains to slow down after that because even though this market doesn’t want to go down, headlines are negative enough that those with cash will remain reluctant to chase prices higher. That won’t happen until big money returns from their summer cottages this fall. Those deep pockets will fuel the chasing into year-end and things are setting up for a strong finish to 2018. What doesn’t kill this market only makes it stronger. If you found this post useful, return the favor by sharing it on Twitter, Reddit, Facebook and StockTwits!